In a word… this is NOM. 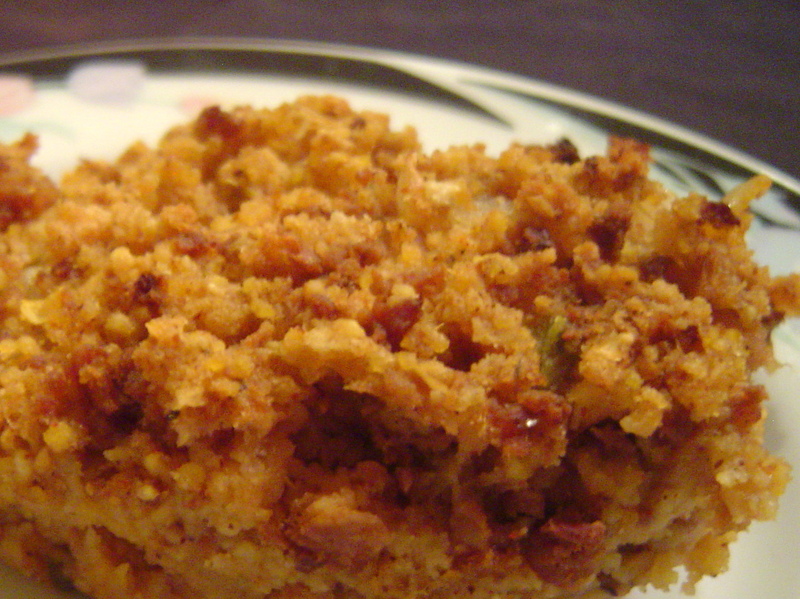 Stuffing is by far my favorite item on a Thanksgiving Day menu. Personally, I love when there is a more traditional savory stuffing and then a different one to eat as well. I actually went to one home a long time ago and they had THREE stuffing dishes. It was heaven, let me tell you. This stuffing is a bit spicy, so I probably wouldn’t stuff the bird with it if that is your thing. But the good thing about it is that it’s delicious and I believe would make an awesome side dish anytime of the year. * As I mentioned above this is a spicy dish. If you don’t like very spicy things you can reduce the jalapenos to 1 tablespoon and the chorizo to ¾ a pound. ** You can use fresh cornbread or the bag variety. 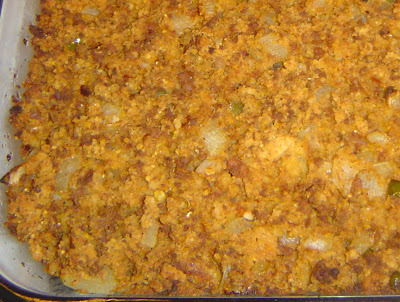 If using fresh, crumble and dry out in the oven on a low heat. 1. Add the diced onion to a large sauté pan with two tablespoons of butter. Sauté over medium heat until onions are translucent – about 8 minutes. Add garlic, celery salt and jalapeños. Sauté for two minutes and add pepper to taste. Remove from heat and add to a large mixing bowl and set aside. 2. Remove chorizo from their casings and add to the same sauté pan. With a spoon crumble chorizo and cook for 5-7 minutes. Remove from heat, drain excess grease and add to the same mixing bowl. 3. To the mixing bowl add the crumbled cornbread and chicken broth, stir to fully combine. 4. Grease a 9x13 casserole dish with remaining tablespoon of butter. Add stuffing mixture and smooth out with a spoon. 5. Bake in a preheated 350 degree oven, uncovered for 40 -45 minutes. Thoughts: This stuffing has a lot of flavor. The chorizo and cornbread go so well together and the jalapeno adds a nice level of depth and heat. The stuffing itself is moist on the inside and has a nice crunchy top layer, which to me is perfect stuffing. So if your menu isn’t finalized or you want to contribute something different this year, I highly recommend giving this a try.